It feels like Brazilian coffees are the underdogs of the Speciality coffee industry, yet they also play an important role in making coffee accessible to a broader range of coffee drinkers. And they would surprize most, if we were given more opportunity to pay the same attention at every stage of production as you see in countries like Kenya for example. Our goal with the Brazilian coffees we buy is to show both what Brazil has to offer and to deliver a coffee that is very drinkable! There are a lot of coffees to choose from in Brazil, it has been important to us to build a concept where we can work with producers where the commitment is mutual and where we have traceability both for the smaller volumes, where coffees have been specially prepared or processed, as well as for the larger volumes. 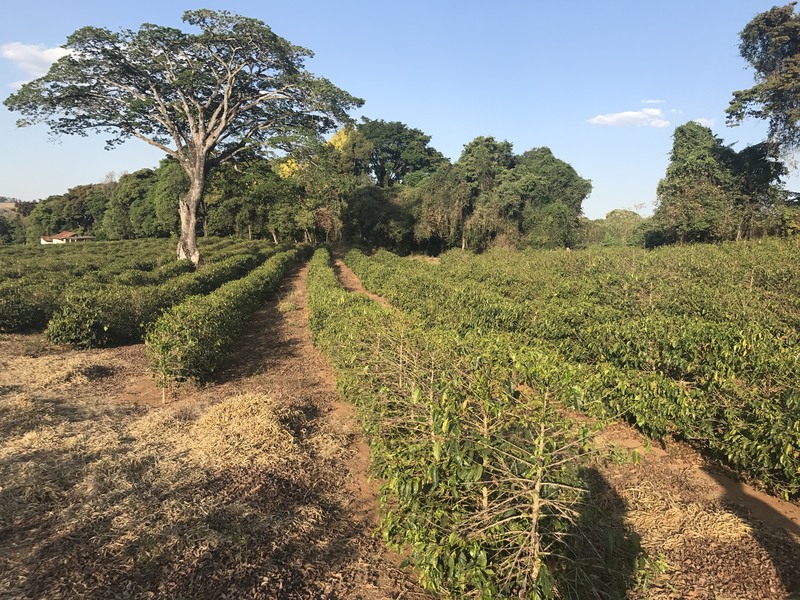 We work in partnership with producers to consistently offer prices that are relevant to the cup quality, and that also allow producers to sustain their businesses. Brazil is a country that struggles against many factors to produce a coffee that the market will value at a price that makes production viable. While the country is well known for being populated with single farms that produce larger quantities than any other country’s single farmers, there are also many small to medium producers. While the large farms are able to offset the costs of production against the sheer volumes they produce, for the smaller producers managing costs and receiving a price that equates to good business is still very much a struggle. We have found that coffees in bigger volume lots, that are stable and consistent, are well used and appreciated. But there is also a very interesting thing that happens when you agree with a producer to support additional effort in picking or preparation of a coffee buy guaranteeing a price. This is when you truly see what Brazil can be. Prices are negotiated with producer, where we are buying micro lots prices are more than 2 times the current c-market price. We are working on a program with small to medium producers, were we are offering stable and fair prices on larger volumes that cup well but also offering premiums on smaller lots where they are making additional effort in the preparation. The coffees are always traceable back to a specific farm, and in most cases to a specific block. We cup and do pre-selection in origin to calibrate and give feedback to producers, and to have firsthand information of what we are tasting and buying. All coffees are cupped blindly, and properly scored and evaluated before purchase. Our selection is based on a scoring system, where the general cut of is at a minimum of 84 points. Coffee is believed to have been first introduced to Brazil in the 1700s, and pretty quickly after this and ever since Brazil has been known as being the largest single producer of coffee in the World. The sheer area mass covered by plantations across Brazil is almost the same size as Belgium. The production is predominantly Natural processed coffees, this process is the traditional method before de-pulping machines were introduced and is also thought to compensate for the lower altitudes coffee is often grown at in comparison to other producing countries. There is also a fair amount of Pulped Natural, while Fully washed coffees are only found in small amounts. Our work in Brazil began through the idea that it would be valuable to buy consistently from one producer and be able to offer traceable and good value Brazil coffees that still gave producers a price that allowed them to build their business and improve production. A partnership based on this idea first began with Natalia & Andre and their farm Jaguara, since then it has grown to include five or so other producers. We have a good relationship with Andre and Natalia. We have been working with them over the last four years and through this partnership we have developed our buying strategy. Natalia’s work with a local exporter gives her greater access to a lot of small to medium producers in the region that are working pretty hard to differentiate themselves and create value. We both find it more interesting to work with, and see the potential of these kinds of producers over other supply chains available in Brazil. Over this time we have been working together we are always cupping together and sharing our experiences, in this way Natalia is well calibrated with what kind of profiles we value. It is important to us to work with producers who are committed to what they are doing and where the business relationship allows for everyone to make their fair share. We want to come back year after year and see these producers thriving and developing. The range of cultivars grown in Brazil is vast and ever developing, there are a lot of resources available for research and development of new cultivars. 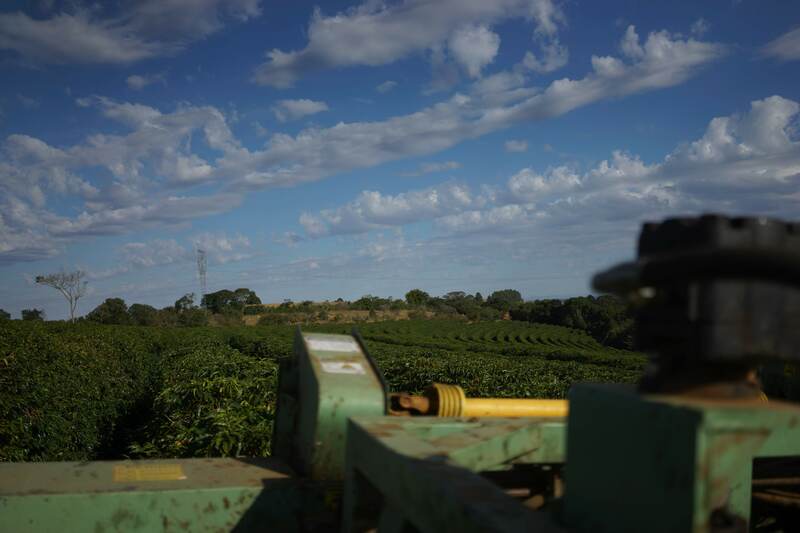 In the area we are mainly working in, Minas Gerais, the cultivars we most commonly see are Catuaí, Mundo Novo, Icatu, Obatã, Catuaí and more recently Acaia. Cost of production in Brazil has risen substantially in the last years, due to general cost of living increases. Labour being one of the most costly parts of producing coffees, while on flat or larger farms mechanical picking is a viable option. For smaller or farms situated on hilly terrain this is not possible and farmers have to optimize capturing as much of the harvest as possible with limited resources for picking. 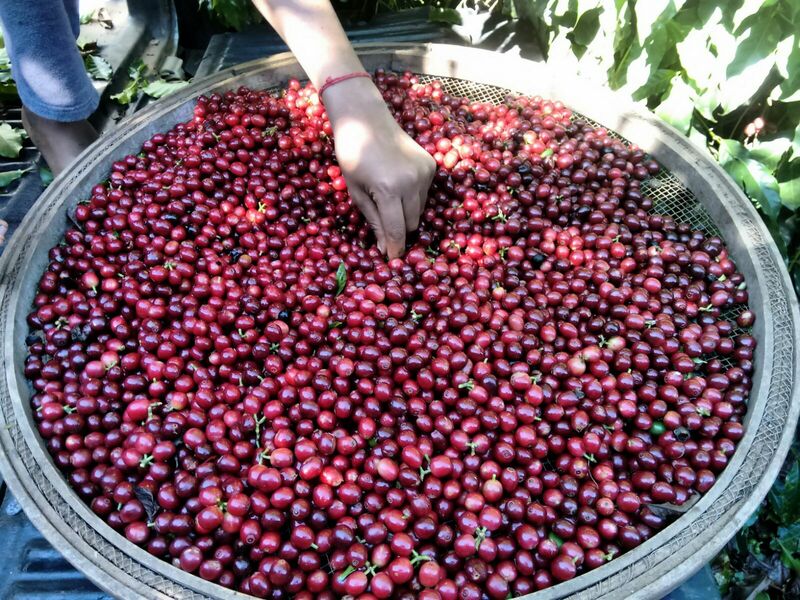 It is common in Brazil to see cherry of all sorts and colours in the coffee picked and drying, the common belief in the industry internally is that this will be sorted out through the milling process. The reality is, that it is just too expensive to pick only ripe cherries for the prices that Brazilian coffees are sold at in the market.We are working with producers to do some lots with selective picking, and while we undoubtedly see a difference in the cup the producers report a difference in cost of 3 times that of standard picking procedures. We have unintentionally been buying predominantly Natural coffees from Brazil. While we are open to Pulped Naturals, which there is a large amount produced, and Fully Washed, which are found much less frequently, it seems that we favour the fruit and sweetness in the Natural processed coffees. Drying in Brazil is almost entirely done on concrete patios, in some cases where a producer has a very simple set up, Natural coffees can even be found to be being dried directly on the ground. We are working with some producers who use both patio and raised African beds, and this isa well discussed topic among us. 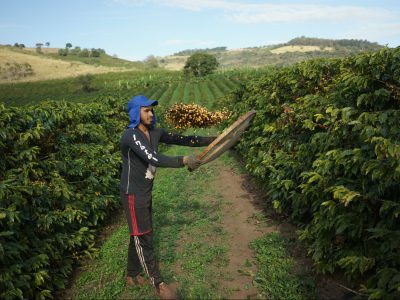 In Minas Gerais at the time when a lot of the coffees are drying the daytime temperature can reach highs of around 25 degrees celsius, but both in the evening and morning it can be very cold. Some of our partners argue that while the raised beds allow for aeration the patios absorb the heat from the day and carry this into the cold temperatures of the night and early morning not allowing the coffee to drop in temperature to the same extent as the raised African beds. We have not done any experiments, nor had any experience to confirm or deny such a claim!